The Type 10 DI box is the ideal counterpart to Countryman's classic Type 85, combining the exceptional ruggedness and versatility of the Type 85 with an advanced design that sets a new standard for pure performance. 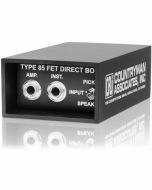 Most direct box designs must make difficult tradeoffs with your sound: ultra-low distortion can only be attained by increasing input noise; true ground isolation means high phase deviation or signal attenuation. The Type 10 takes a radically new approach, with an analog circuit that tunes itself to deliver your sound with the lowest distortion, lowest noise, and highest accuracy of any direct box. The result is a clean, precise sound that is completely faithful to the original. The Type 10 achieves the highest SNR, lowest phase deviation, and lowest distortion of any DI. Some boxes achieve low distortion over a narrow range of frequencies and levels, but end up coloring the low frequencies and distorting loud signals. The Type 10 maintains exceptionally low THD and IMD across the entire audio band, and for a wide range of input voltages, rendering your sound with extremely high fidelity.